Hello. This past Saturday (8/22/09) my family and i were given a male Jack Russel Terrier mixed with a Welsh Corgy and some pit bull, we believe. He is very young to be with us, seven weeks old tomorrow. He has been biting anyone and anything. We can't seem to control it. And his teeth are very very sharp. Any tips? Will this get better as he grows older? Thanks! 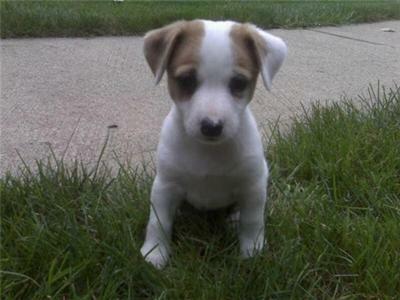 My jack russell was constantly biting at this age. We got her a little too young as well, 7 weeks. Try to surround him with lots of chew toys like dental ropes, squeaky toys, Puppy Kongs, Stuffed animals, old socks, old necktie etc, etc. Have some within grabbing distance and replace your hand (which he is biting) with a chew toy and praise him when he chews the toy instead. Play lots of tug. It's a old myth that tug is bad for dogs, or that it encourages aggressiveness. Actually, out very experienced trainer taught us that in the wild, tug-type skills are necessary for cooperation (such as tearing up a carcass) and these are necessary for bonding within the pack. Tug is great for teaching them to bit the toy, and not you. When you play tug, DON'T PULL UP! This is tempting because a Jack Russel will allow you to pull them off the floor with a tug toy. However, this is really bad for their neck.